It is practically Monday which means I am 34 weeks, hehe. But for now...I guess I am 33 weeks pregnant! Less than 2 weeks until I am officially 8 months pregnant! Top: from Herajuku, Japan years ago haha. "Harajuku Girls you got the wicked style. I like the way that you are, I am your biggest fan." Anyways, it is a Gwen Stefani song and Herajuku is a place in Japan where the Japanese have CRAZY style. CRAZY I TELL YOU!!! Wearing 5 inch platforms with fake fish in them, men wearing thongs over their outfits, wearing gothic poofy dress outfits, anything goes...it was very fun to see all of them! How Far Along: 33 weeks, 5 days. 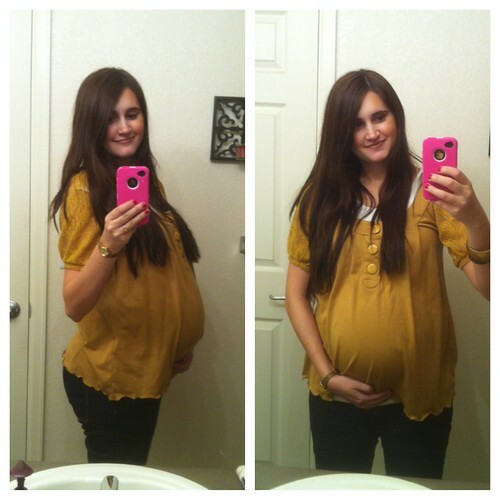 3rd trimester! As of today there are 44 days until the due date! Size of the Baby: Pineapple, 4.9 lbs, 19-22 inches long! Stretch marks: Actually I have a couple tiny ones on each side of my hip...guess my stomach is getting big! They are small and will fade so I'm not too worried. Weight gain/loss: 26 lbs. Will find out the updated weight on Monday at my 34 week appointment. 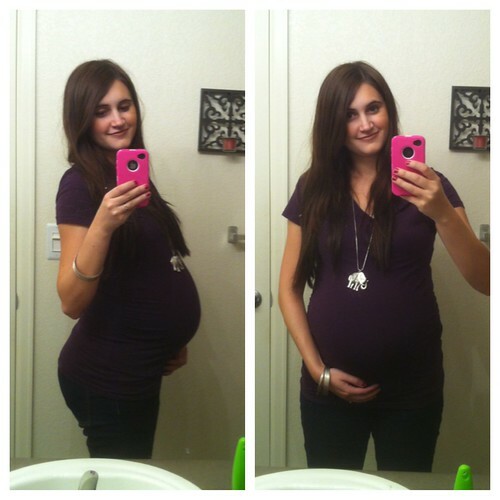 At this point in your pregnancy the baby is growing so much! This is where they pack on their pounds and fat and fill out those wrinkles haha! Sleep: It actually has been not too bad recently. I think maybe having a big stomach makes sleeping on your side more comfortable? Last night wasn't the best though. My calves were cramping and some muscles in my low back were uncomfortable. I think having a fan helps! Best Moment of the Week: Umm, we got our crib and the nursery is coming together, slowly. So that is awesome. 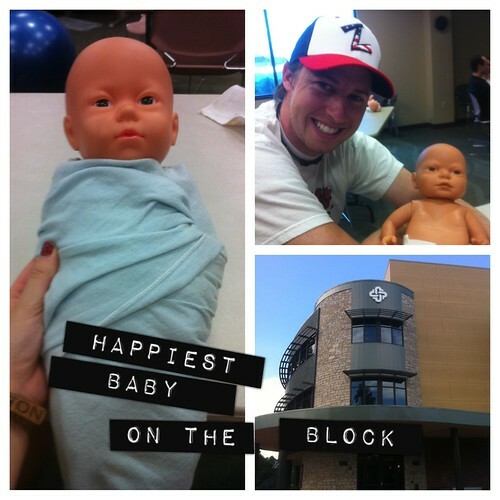 Ohhh we went to a class on 'The Happiest Baby on the Block' and it was pretty awesome! I feel more confidant now that I know some techniques to calm my son...but I guess we will see how it goes when he comes haha. Movement: Oh he is a crazy man in there. He always gets the hiccups and moves like crazy! Symptoms: Leg cramps/sore calves, sciatica, back pain, heartburn, and tired feet...think that is basically it. Nothing too bad. Food Cravings: Ummm I'm not sure if I've had any this week! I don't know if I honestly believe in people having true food cravings. Obviously there will always be food (being pregnant or not) that sounds good or maybe amazing and you may die to have it...but I don't feel like I've been uncontrollably desiring some food. Call me crazy but maybe it is just something pregnant woman do because, I don't know, they can...? Like really, please explain if you believe otherwise. Were you going to DIE if you didn't have a certain fruit? Like more than you would if you weren't pregnant? I don't know...just a thought. Anything making you queasy or sick: When I gag haha. It is always in the mornings. Wedding ring on or off: Off and wearing random rings! What I miss: Healthy back, being able to workout harder, and feeling dang good. 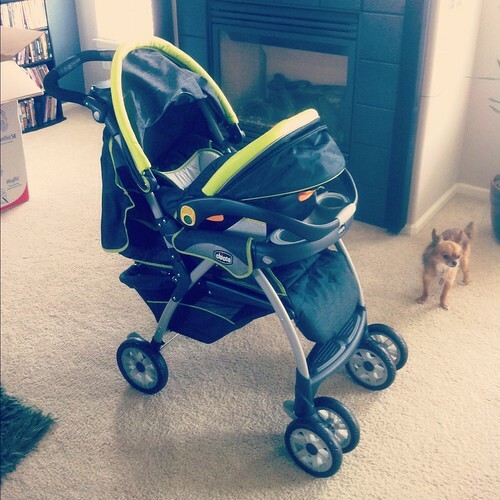 We finally put together our Chicco Cortina Travel System! After hours of research and debate we ended up going with a Chicco travel system instead of a car seat and then either a Phil & Ted Explorer, Britax B-Ready, or my favorite the Baby Jogger City Select. With each of those strollers you would need to buy an adapter to fit the car seat in, a second seat (for a future child), and random parts if you wanted a cup holder, etc. We went with the Chicco system because it is cheaper and we figure when we have our second child we will get one of the nicer ones then. 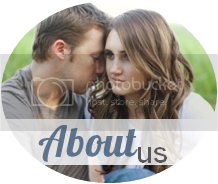 We will for sure need it because we have the second child and now we don't know when we will have our second child. I guess it depends how our son goes haha and how crazy he is. By then, they will probably have even newer better strollers. It may have been a good investment to get one now, but you never know. But we LOVE our Chicco travel system. It comes with the Chicco Keyfit which is the #1 best rated car seat right now for safety. And, that car seat alone, when bought separately, almost costs as much as the whole travel system. So we got the stroller with it for minimal cost. And we used a 20% off coupon. And I love the dark grey and lime green combo. My favorite color is green and it looks bomb. Yes, we analyze our stroller options very intensely, so good for you if you read this whole thing haha! Here is a glimpse at our Happiest Baby on the Block class! I think the class was super helpful! Kevin and I both became pros at swaddling and other things as well! What are some of your favorite books to read babies/little kids? I want to get a good collection going, and right now...we just have one and it is a dog book haha. It is called Dogs and is actually a really cool one lol. I'm not pregnant and never have been (yet) but I was just telling my husband that I felt the same way about pregnancy cravings. 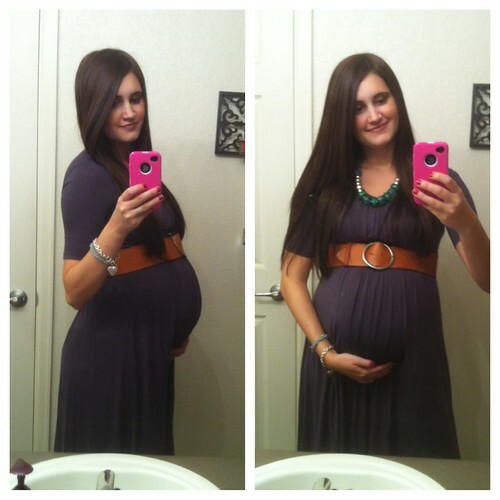 Without being pregnant I still crave a LOT of foods, all the time, and of course I won't DIE without them, but I want them really badly... but the thing I think with pregnancy is I've heard people who hate certain foods but then crave them during their pregnancy, that seems so weird. I will not be eating any pickles or dirt when I am pregnant, thank you.... maybe its a vitamin deficiency thing?